Message boards : News : I'm a postdoc! 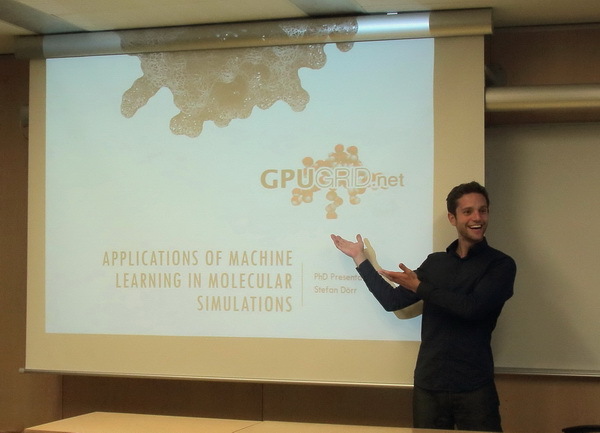 I successfully defended my Ph.D. on the 16th of September! Now I'm continuing for a while as a postdoc in your good-ole well-known lab. I would like to thank you all for making this possible! Without you* I would never have done all this cool research, publications and completed my thesis. Many, many thanks and to further awesome research! Message 44840 - Posted: 25 Oct 2016 | 20:39:55 UTC - in response to Message 44836. Great news, Stefan!! May your career fulfill your dreams! Great news. All happiness to you! Congratulations, Stefan, and my best wishes !!! Congratulations, Stefan and much success to follow. Congratulations, Stefan! Very happy to have been able to help out! Stefan - Congratulations - wishing you the very best in your future endeavors! Message 45188 - Posted: 5 Nov 2016 | 8:55:12 UTC - in response to Message 44836. Glad to see that you still remains among us!